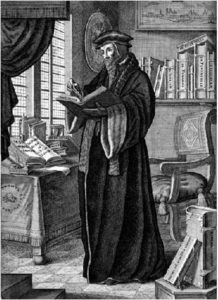 July 10th, 2009, marked the 500th anniversary of the birth of John Calvin (1509-1564). This year of 2017 marks the 500th anniversary of reformer Martin Luther nailing his 95 Theses on the Castle Church at Wittenberg. As we celebrate together this blessed occasion of the special working of God’s glorious Spirit, let us seek as a congregation to remember our father in the faith, John Calvin. As God’s holy and beloved people in Christ, it is important to remember our forefathers and foremothers before us. In fact, the Scripture teaches us to “Remember our leaders, those who spoke to you the word of God. Consider the outcome of their way of life, and imitate their faith” (Heb. 13:7). Surely this encourages God’s people to honor our faithful leaders and teachers who live with us as well as those who have lived before us. Our celebration of John Calvin’s life and teaching in the next few months is not intended merely to celebrate a man of flesh and blood like you and me, but to celebrate God’s good work by His Spirit in and through the man John Calvin. God was at work by His Spirit in the Reformation of the Sixteenth Century, and we can “remember our leaders” and “consider the outcome of their way of life, and imitate their faith” today, by God’s good grace. John Calvin was first and foremost a Christian who loved the Lord Jesus Christ. Calvin craved earnestly for God to be glorified in every aspect of the Christian’s life. Calvin taught that the motive of man’s existence should be zeal for the glory of God “For we are born first of all for God, and not for ourselves.” Calvin’s life demonstrated the life of the persevering pilgrim and a faithful pastor-shepherd of God’s flock. As a biblical, reformed-catholic, pastor-theologian, Calvin stands with Augustine and Thomas Aquinas in his sweet Christian influence and able theological mind. His theology reveals a thorough and in-depth knowledge of the Holy Scriptures and an ability to clearly make the truth of Scripture known. Calvin’s goal and commitment in study, writing, preaching, and teaching was always “clarity and brevity” to the glory of the Triune God. He desired to clearly present God’s truth in as brief a manner as possible (though what he described as brief might seem a bit lengthy to American Christians today!). The brevity and clarity that Calvin sought was in reaction to the often confusing and labyrinthine theology practiced in the medieval church by the Scholastics or Schoolmen, as they were known. “For he was looking forward to the city that has foundations, whose designer and builder is God” (Heb. 11:10). When one reads Calvin’s writings, one is struck by the fact that this is a fellow pilgrim along the way, seeking the Eternal City, and desiring to know God and himself according to the Scriptures. His writings reveal a heart that is stirred by the love and grace of God and a dedication to making these scriptures known systematically to the people of God so that they can confess the true faith of our fathers. As a loving pastor, Calvin desired God’s people to know Holy Scripture in order to have a true knowledge of God and themselves, and to live out this truth by God’s grace for the glory of God. As a faithful servant and churchman, Calvin’s goal was to organize churches and the worship of the congregation under the Lordship of Christ the King according to scriptural teaching alone. Calvin fervently believed in the supremacy of Christ the King over both creation and redemption, and His teaching over both Church and State. He believed that all of life should be Reformed according to Holy Scripture. As we will learn more about in future studies, Calvin’s Institutes in the Christian Religion is one of the most biblical, clearest, and influential books of pastoral theology ever to be written. Calvin’s Institutes of the Christian Religion (or “Principles of the Christian Religion”) is not strictly speaking a summa theologiae (“summary of theology” like Thomas Aquinas), but more precisely as it was written by a persevering pilgrim and faithful pastor, it is an astoundingly, warm-hearted summa pietatis (“summary of piety/godliness”). It is a book about Christian piety, or how to rightly cultivate godliness and true spirituality in the fear of the LORD, learning to more biblically and effectively love and serve God and neighbor by the power of the Holy Spirit. Irony of ironies, that the father of Arminianism praised John Calvin in such a way! If only Arminius had also by God’s good Spirit inculcated some of Calvin’s humility and drank more deeply at the Fountains of Olympia. A little knowledge is a dangerous thing indeed! “O Lord, you are our Creator, and we are the work of your hands. You are our Shepherd, we are your flock. You are our Redeemer, we are the people you have bought back. You are our God, we are your inheritance. Therefore, be not angry against us, to correct us in your wrath. Recall not our iniquity to punish it, but discipline us gently in your kindliness. Be mindful that your name is called upon among us and that we bear your mark and badge.